Yosemite Fire Called One Of Largest In Recent California History : The Two-Way The Rim Fire, which has crossed into Yosemite National Park, is already affecting the power supply to the Bay Area, 150 miles to the west. The Rim Fire consumes trees on Friday near Groveland, California. A wildfire that has spread into Yosemite National Park is now threatening the power grid that supplies San Francisco, prompting Gov. Jerry Brown to declare an emergency for the city. 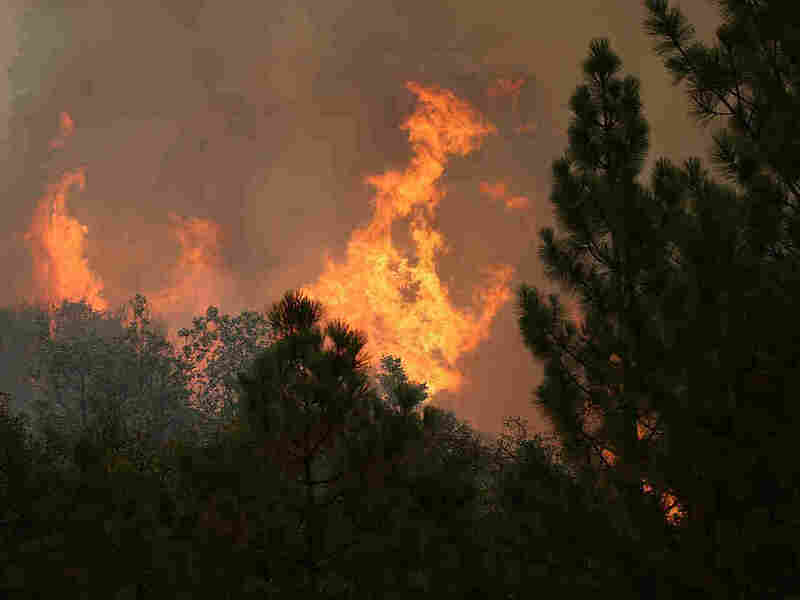 The 200-square-mile Rim Fire also threatens thousands of homes and has forced the evacuations of hundreds. Bob Hensley, reporting for NPR, says that in issuing the state of emergency for the city of San Francisco and San Francisco County late Friday, Brown indicated the wildfire has damaged the electrical infrastructure that provides power to the Bay Area 150 miles to the west. Brown said Bay Area utility officials have had to shut down transmission lines and that so far, the city has been able to keep the power on, even though further disruptions could change that. He said the city's water supply could also be affected by the fire. The Associated Press says San Francisco gets 85 percent of its water from the Yosemite-area Hetch Hetchy reservoir that is about 4 miles from the fire. Meanwhile, the fire has been spreading for nearly a week and only a small fraction of it has been contained. "... established at least a foothold in Yosemite, with at least 17 of its 196 square miles burning inside the park's broad borders, in a remote area near Lake Eleanor where backpackers seek summer solace." The U.S. Forest Service says the fire is threatening about 5,500 homes and had already destroyed four homes and 12 outbuildings in several different areas. The San Jose Mercury News quotes Cal Fire spokesman Daniel Berlant as saying about 2,700 firefighters were working the Rim Fire. Berlant said the rugged terrain has made it difficult to contain the blaze. "'And now the fire has grown to a size and intensity where it's creating its own wind and weather,' Berlant said. As of Friday evening, it was only 5 percent contained, but that was up from 2 percent earlier in the day." "Officials issued voluntary evacuation advisories for two new towns — Tuolumne City, population 1,800, and Ponderosa Hills, a community of several hundred — which are about five miles from the fire line, Forest Service spokesman Jerry Snyder said. A mandatory evacuation order remained in effect for part of Pine Mountain Lake, a summer gated community a few miles from the fire." The Los Angeles Times reports that firefighters on Saturday were able to decrease the risk to San Francisco's water and power systems. "Firefighters were able to gain containment of an area Saturday near the Hetch Hetchy water and power system, which supplies electricity and water for San Francisco. The San Francisco Public Utilities Commission has been forced to shut down two of its three hydroelectric power stations because of the fire." But the Times also called the fire "one of the largest wildfires in recent California history," and said it had burned more than 125,000 acres. "The fast-moving Rim fire has doubled in size since Thursday night and remains only 5% contained, with steep terrain, warm weather and low humidity hampering firefighting efforts. Adding to the difficulty is the blaze's tendency to burn the tops of trees, creating a "crown fire" with long, intense flames that skip across forested land faster than a wildfire that creeps along near the ground."